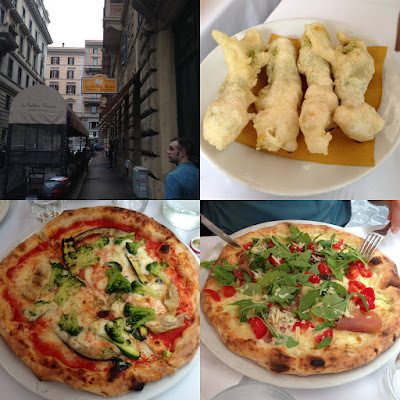 We also decided to try our first Roman pizza, and we somehow got the impression that the pizzas on the menu were a single-serving size, so we each ordered one. We were astounded at what showed up on our plates! I hated having to waste so much food but there was no way I was eating nearly all that pizza. Steve got arugula (which amusingly often gets translated "rocket salad" on English menus), proscuitto and cherry tomatoes on his; I discovered the hard way that zucchini, eggplant, and broccoli don't really belong on pizza. We continued on to Basilica di San Clemente, which seemed like a great first taste of the history of Rome. From there we returned to the Colosseum. Rather than paying for audioguides or a tour guide, we used the Rick Steves Audio Europe app to learn about what we were seeing. It was incredible to stand in such an impressive structure that has lasted for so many centuries--yet also disturbing to look around and think about the horrifyingly barbaric things that happened here. 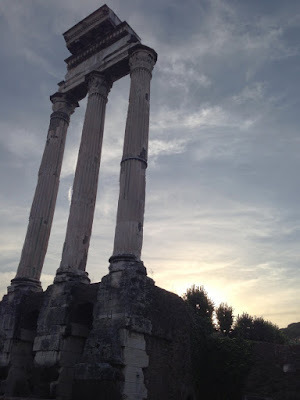 ...and then made our way into the Forum, for which we also used the Rick Steves audioguide. You enter the Forum by walking up the Via Sacra. 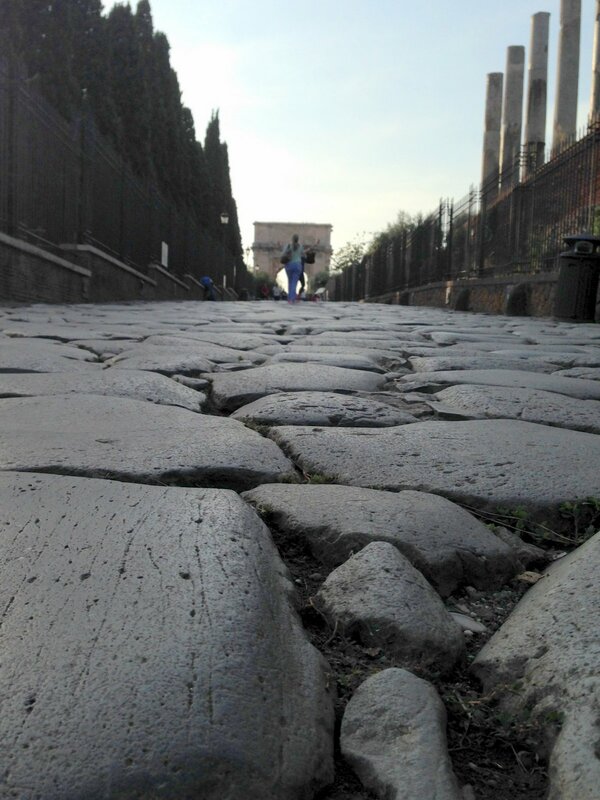 It was just crazy to think that Caesar walked these same cobblestones. "Most interpreters see this as a reference to the lavish victory parades celebrated in Rome after great battles. God is depicted as the sovereign victor, with Christ as the general, leading the victory procession, and Paul as “captured” by Christ but now joyfully following him. 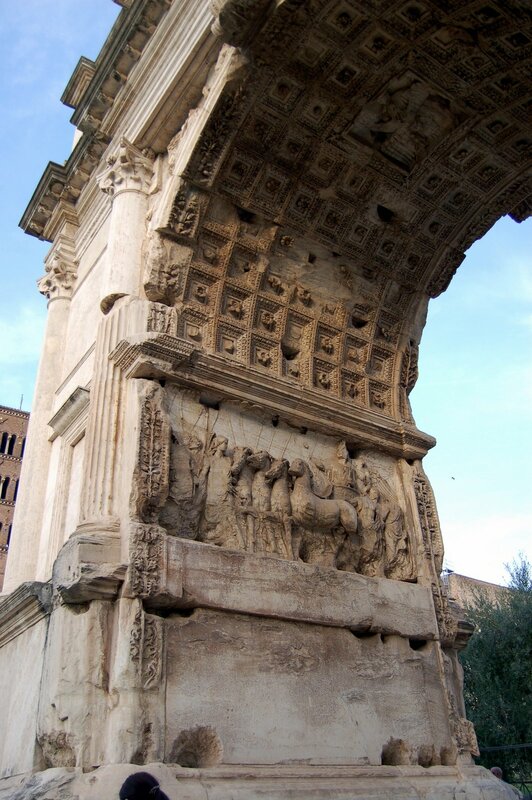 Images of such parades are still visible in some ancient works of art, such as in the reliefs on the late-first-century Arch of Titus in Rome commemorating the emperor’s victory over Jerusalem." ...and then to see the Arch of Titus with its depictions of the very images Paul had in mind as he wrote 2 Corinthians! ...and we got kicked out of the Forum, which closes at 7PM. Exhausted and hungry, we walked back to the neighborhood of our B&B for dinner. A place called Vecchia Roma was already on my list, so when our hosts recommended it, we knew we needed to try it. I'm going to back up and post a food overview of sorts tomorrow, I think, but for now I can show you the first two classic Roman dishes we tried. Our primo was bucatini all'amatriciana, which looks like basic spaghetti but has pieces of smoked guanciale (pork cheek) in it. YUM. It was also our first time eating bucatini, which is similar to spaghetti, but fatter and hollow--making it impossible to twirl on a fork! 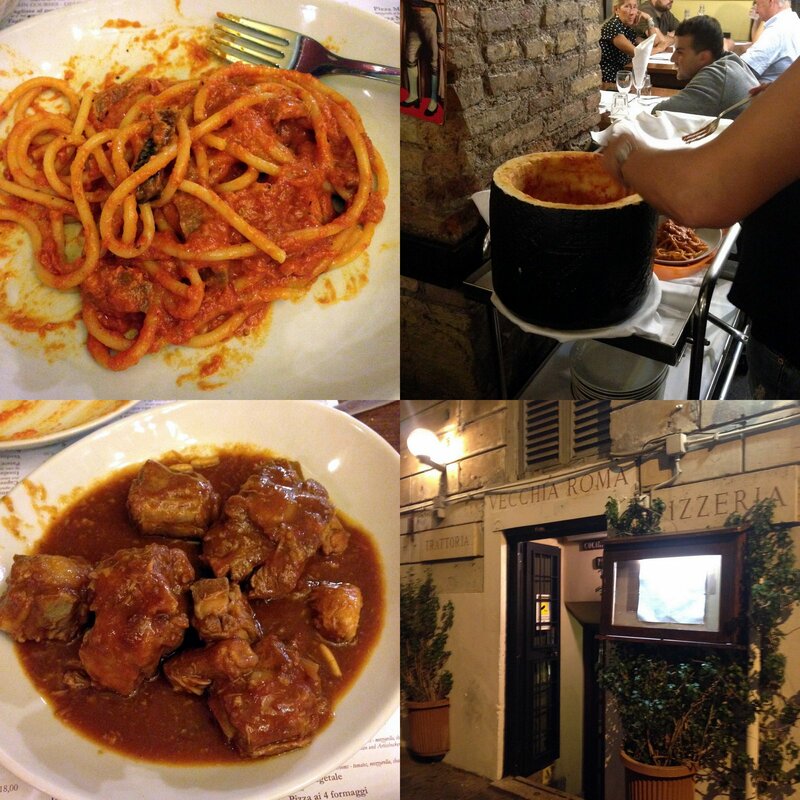 For our secondo, we tried coda alla vaccinara: oxtail stew. We'd actually eaten oxtail once before here at home, so we knew what to expect, but it was delicious, even if it is a lot of work to find the bits of tender meat among all the bones and gristle. 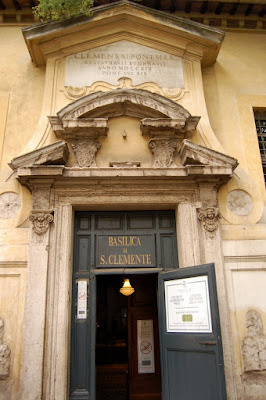 With our first dinner in Rome a delicious success, we returned to the B&B and crashed.